Björk has built a career and earned a worldwide audience by doing the unexpected, repeatedly. From her years with The Sugarcubes to her solo albums, the Icelandic singer has visited nearly every genre, always hanging on the bleeding edge of the avant- garde. Dense and polymorphic, Björk’s music is presented as art, with songs as chapters instead of singles. The mixture of musical elixir found on her latest album, Volta, is on par with her previous solo works. The music is classical and futuristic, industrial and pristine. Tribal rhythms, marching drums and orchestral strings fly through hypersonic layers of hip-hop producer Timbaland’s keyboards and digital effects. Volta is highly cohesive and has enjoyed commercial success around the world, spending nine weeks at number one on Billboard’s Electronic Albums chart. Touring in support of Volta, Björk visited America for the first time in four years, appearing at Coachella in May and returning to Los Angeles in December for a show at the new Nokia Theatre, located downtown across the street from the Staples Center. Björk strives to be an artiste, and her live show is no exception. Every effort is made to replicate the sound of her albums AND everything is recreated live. There are no backing tracks. For this tour, in addition to a full band and several sound technicians manning electronic consoles, she brought a 14 person Icelandic female choir, who also double as a brass section. The Nokia is built in the new style of mid-sized venues. It is wide and tall, maximizing space for attendees while giving everyone a good line of sight. It’s slightly too cavernous for optimum acoustics, but it’s a good place to see a show in Los Angeles during the winter when it’s too cold at night to be outside at the Greek Theatre or the show is too big for The Wiltern. 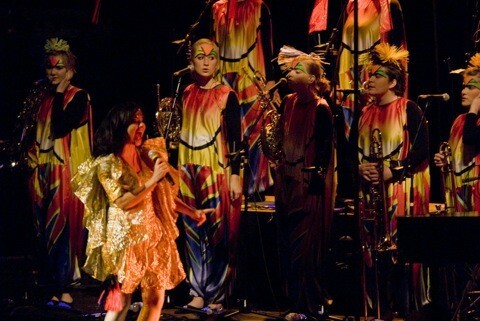 Björk employed plasma screens that added a theatrical twist to her show. The screens were set up in front of the three musical technicians and “appeared” to show the audience an overhead perspective of what the technicians were doing with their hands. I say “appeared” because the screens depicted green pools of plasma that the technicians manipulated with their movements, shifting orbs of light like something out of Minority Report. There was a slight look of the Cremaster Cycle (the renowned art films by Björk’s longtime companion, Matthew Barney) to it as well, and I couldn’t quite tell if the screens were actually showing what was happening live or simply replaying images that the technicians were mimicking with their movements. On this evening the artists, indie rockers and environmentalists of all skin colors and ethnicities that comprise Los Angeles stood together and raised their freak flags with pride, led by the Elfin queen from Iceland who united us all with her pleas to return to nature and rage against the machine which seeks to assimilate us all.